We have a pair, but these are being sold individually. Gorgeous French Chairs discovered in an open market in Paris. 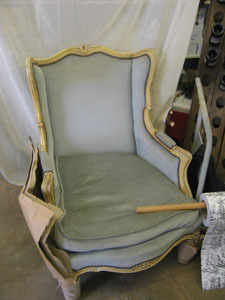 Excellent condition and while upholstery could use a facelift, they are useable in their current condition. We're happy to put on your fabric, or assist you with picking something complementary-call for details. 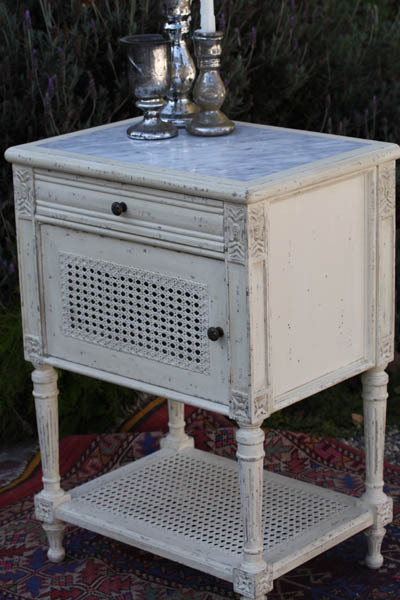 What a darling reproduction off an 1800's antique version from our friends at Blanc D' ivoire/ Paris. Generous top with lip all around, and useful drawer and shelf. French Grey color. 18" wide x 18" long x 28" Height. Special reduced shipping rate: $50.00 throughout Continental US. Reg. Price $795.00 $295.00 On Sale, Lucky Dog! 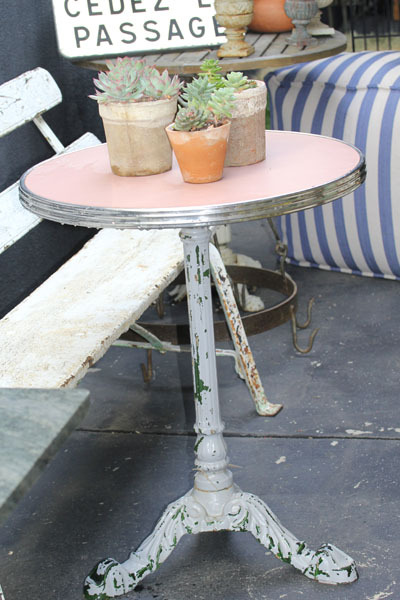 Fabulous old rusted table found in the South of France. 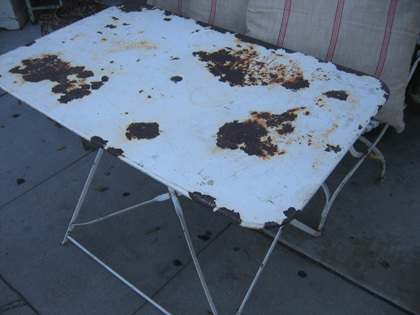 Lots of rust for those like me that like their rustic pieces RUSTIC! Folds flat (ships flat). 38 1/4 x 25 W x 28" H. France, circa 1930. A fantastically beautiful piece! 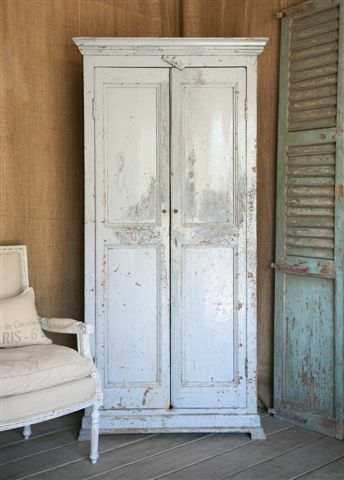 Off White gorgeous armoire with new glass inserts in the double doors. Three movable wood interior shelves. Great condition! France circa 1940. Measures: 83 H x 52 W x 17" Deep; . Local Delivery available from San Diego to Central Coast. All other deliveries via Freight Carrier (arrives blanket wrapped) $450-$550 throughout Continental U.S. only. 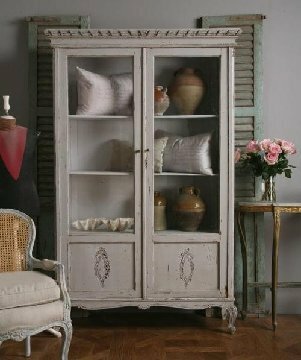 Fantastic vintage armoire with 3 interior shelves. French grey with some distressing here and there but fully intact and sturdy to serve as a bookcase. 81" H 39" W x 19" Deep. France, circa 1930. More Details+Reg. Price $1,595.00 $1,095.00 On Sale, Lucky Dog! Modeled after a Louis XV antique, this is one of our more favorite reproductions. Great attention to detail from the Cabriole legs, two deep and spacious drawers to the slightly distressed creme finish. Measures approx 29" H x 28" W x 17" D. Multiples available. Ships either UPS GROUND oversized or via Freight carrier, depending on ship to address; full address required for quote-vintageweave@aol.com or 323.932.0451. ONLY ONE AVAILABLE. 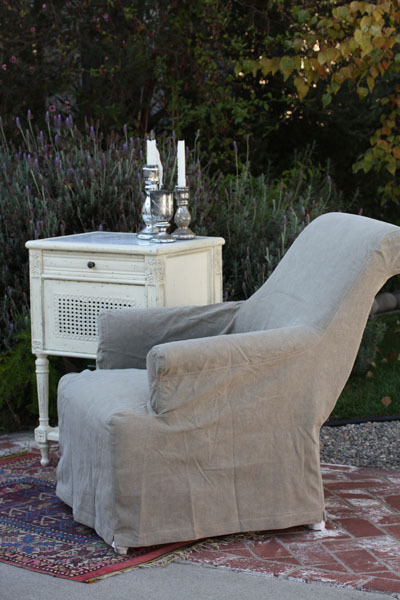 Classic elegance French Bergere with pre-washed hemp slipcover offering both modern and vintage appeal. Bergere back is designed at a slope allowing for ultra in comfort lounging, reading, etc. Vintage style slipcover with modern tight bottom fit around white washed wooden legs. Save 10% when purchased as a pair. Measures 31" H x 32" Wide x 25" Deep. Spot clean or dry clean recommended. Ships via Freight carrier. Reg. Price $1,465.00 $899.00 On Sale, Lucky Dog! 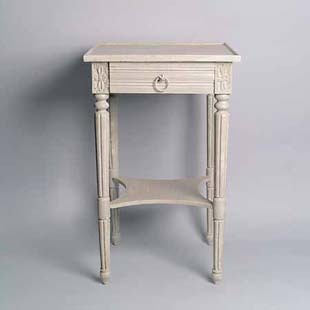 Fabulous nightstand offering the perfect depth and height for bedside or even adjacent to a sofa. Part of the Eloquence Collection. 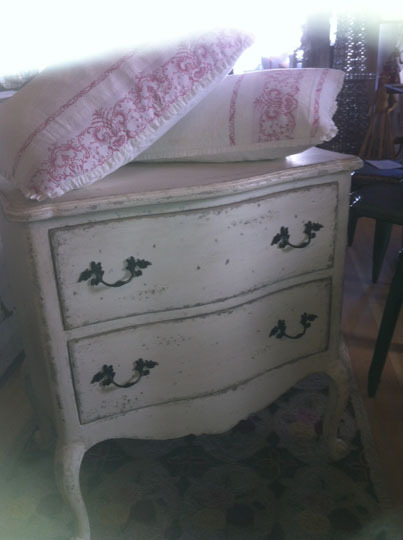 Also available in Antique White (cream shown). Measures 32 H x 22 W x 16" Deep. Multiples available; new. Gorgeous detailing of newly-created bed frame off an 1880's French antique. The vision has resulted in a heavenly addition to any boudoir. Color: creamy stained as shown. Given so many mattress styles, beds do NOT come pre-drilled thus allowing a proper drill hole to fit your particular mattress. No hardware included. 10 yards to reupholster. Provided with a beautiful Belgium linen. Headboard, Footboard and side rails. Shipping available to continental US via freight carrier. Currently only Available in Queen. Takes 12 weeks to order. Online only. Color: creamy white as shown. 10 yards to reupholster. Provided with a beautiful Belgium linen. Headboard, Footboard and side rails. Shipping available to continental US via freight carrier. Currently only Available in Queen. Takes 6-1012 weeks to order. Color: Rubbed silver leaf over carved wood. 10 yards to reupholster. Provided with a beautiful white Belgium linen. Headboard, Footboard and side rails. Shipping available to continental US via freight carrier. Available in Queen or King. Allow 8-12 weeks to order. Reg. Price $3,495.00 $3,100.00 On Sale, Lucky Dog! 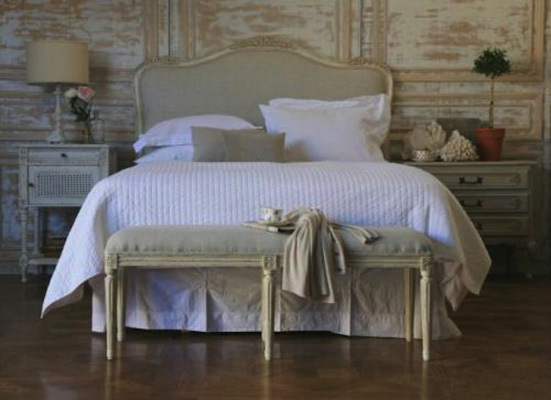 Gorgeous detailing of newly-created bed frame off an 1900's French antique. The vision has resulted in a heavenly addition to any boudoir. Color: Rubbed soft cream over carved wood. Headboard, Footboard and side rails. Shipping available to continental US via freight carrier. Available in Queen or King. Allow 3-4 weeks to order. Online only. 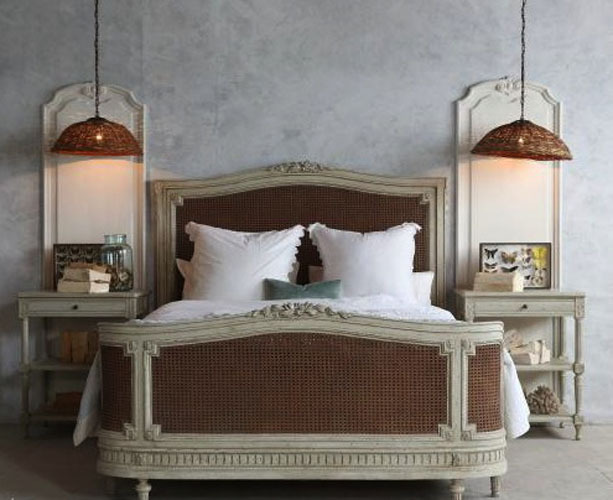 Similar Single headboards sold in the boutique. Color: Rubbed soft cream cane over carved wood. Headboard only. Shipping available to continental US via freight carrier. Available in Queen or King. Allow 3-4 weeks to order. Mad love for this unique bistro table from a Parisian boulangerie that underwent new ownership and new design a few years ago. We bought all four and have this one left available. Approx 23" diam. Affixed metal wrapped melamine top with cast iron base. Base is chipping paint of white and green. VERY sturdy piece. A pretty special piece of Parisian history. Indoor/Outdoor protected from sun. France, circa 1920. Shipping via Plycon; send EXACT address and our pleasure to provide a shipping quote: vintageweave.com. Delivery available from San Diego County to Santa Barbara County. Shipping charges are sent to you via confirmation email once we receive your order; if the total shipping exceeds 25% of your order, we do not bill your card until you approve all charges. FOR ORDER $25 AND OVER, all charges are actual as we never charge a handling fee for continental U.S. Orders! ORDERS UNDER $25 WILL INCUR A $2.00 PROCESSING FEE; International orders will incur a $5 processing fee.